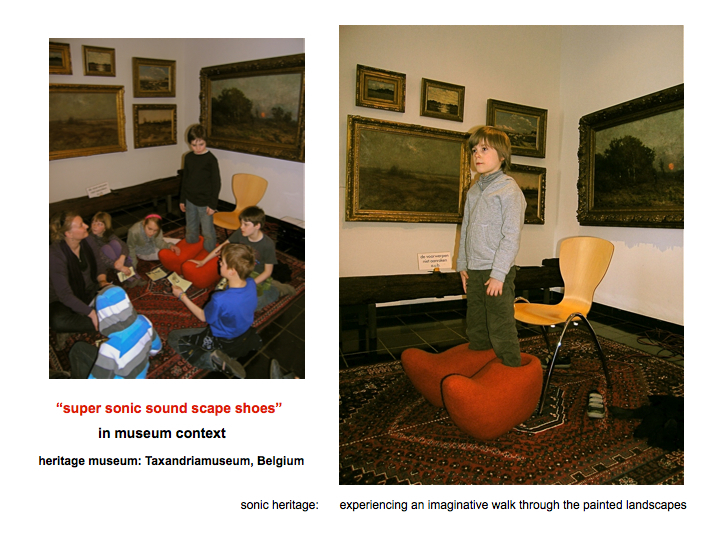 2011 I presented the “super sonic sound scape shoes” in the Taxandria museum in Turnhout, Belgium as part of a children sound art festival: “Storm coming up” Look! Music… The Taxandria Museum is the historical museum about the Belgium Kempen. The installation was standing in a corner on a old carpet surrounded by old oil paintings of the landscape of the Kempen. While standing in the “super sonic sound scape shoes” hearing and feeling the soundscape compositions the landscapes on the “paintings came to life”. 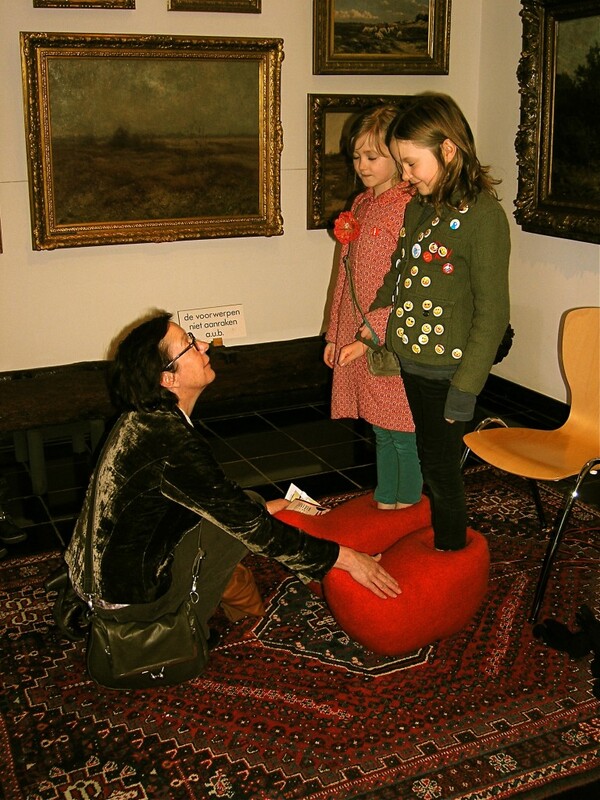 Immerged by the touch soundscapes children could create their own stories and shared them with others by telling what they where hearing and feeling, while looking to the paintings or making drawings afterwards. 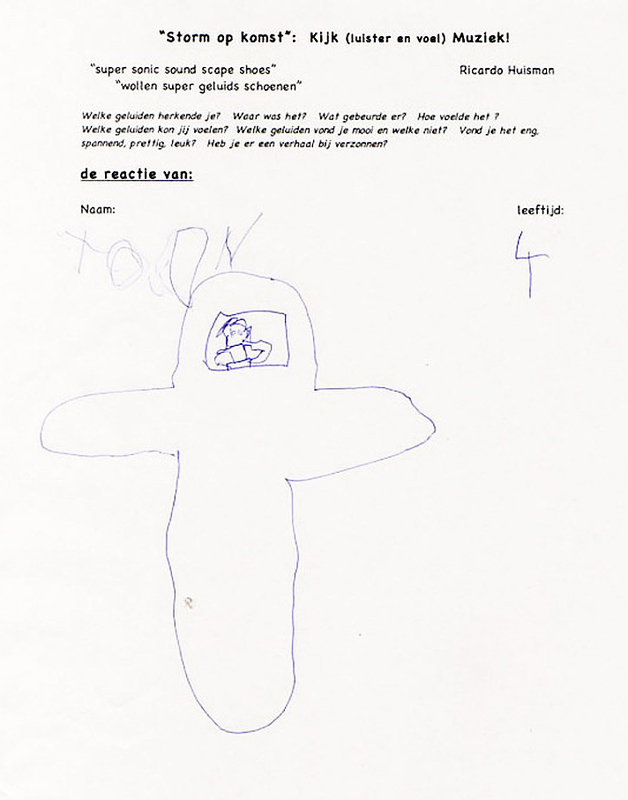 I’ve composed two soundscapes for the small children under 7 years old and for the children older than 7. The first for children until about 7 years with more concrete, recognizable, narrative sounds roughly corresponding with the images on the paintings, with specific sounds: like the walking sound of a farmer on wooden shoes, environmental sounds referring to the landscape of the muddy landscape of the Kempen, with birds (including the sound of the oriole), sheep, etc. and of course a rain and thunder storm. The second for the older 7+ children the soundscape started also with concrete sounds in the context of the museum and was followed up by more abstract soundscapes, including sounds of the other installations presented at the festival. This soundscape was more cool, rhythmic and a bit more scary than the first soundscape.